1. Mark the shape that you would like your puppet theatre to be. For a circus-themed theatre, trace around dinner plates to create soft "tent" curves. 2. Use an Exact-O knife to cut along your marked lines. You can leave a small lip along the back to stop the box from falling over. 3. You can use offcut cardboard to reinforce the box using craft glue. Trim excess. 4. Use paint, electrical tape, or self adhesive book covering to finish your main theatre. Make sure to smooth out air bubbles and cover straight edges. Try snipping with scissors in 2 inch intervals for smoother finish. 5. Last but not least, decorating! Continuing in circus theme, use red electrical or duct tape to make stripes. 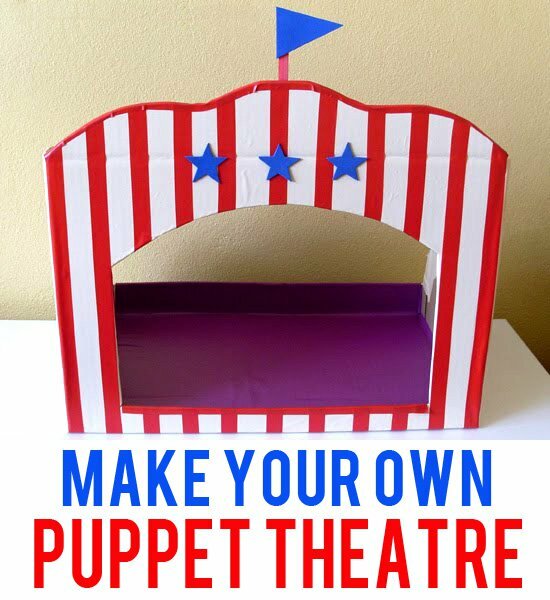 Alternately, let your children help you finish their puppet theatre. You can cut stars, flags, hearts, etc. from craft foam from the dollar store. Use a popsicle stick for the flagpole.